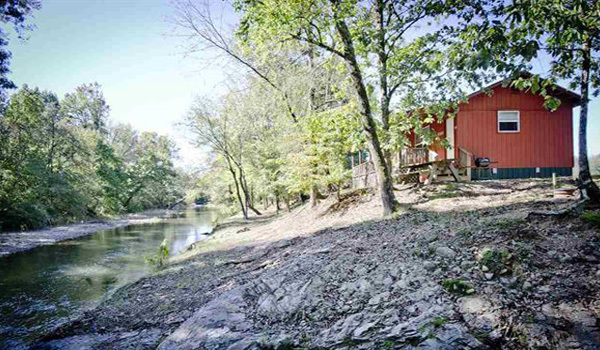 If you are looking for a CLEAN, CLEAN, CLEAN lodge or cabin to rent by owner in the Ouachita mountains of Arkansas for your next vacation, our waterfront cabins are just what you are looking for. Choose from our family lodge or four cozy, secluded cabins on the creek: Love, Faith, Hope or Peace. Each vacation cabin has a fully equipped kitchen, air conditioning, all linens provided and much more. Choose from four cozy, secluded cabins on the creek: Love, Faith, Hope or Peace. Each vacation cabin has a fully equipped kitchen, air conditioning and much more. Each of the cabins is a one bedroom - one bath, with a queen bed and a queen sleeper sofa in the living room. 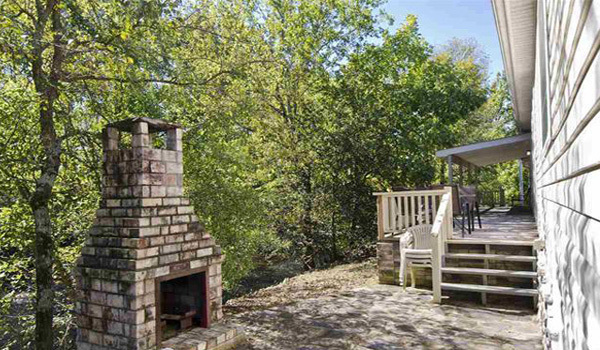 Beautiful, spacious, 3 bedroom, 2 bath Lodge, overlooking the creek and accommodates up to 8 people comfortably. Complete with full kitchen and washer/dryer. Lots of porch space and a brick fireplace on the patio. Grab your family and enjoy the panoramic views! "At Living Water Cabins" is located halfway between Glenwood and Mount Ida, Arkansas in Montgomery County in the area known as the Ouachita Region. So if canoeing the Caddo River, the Ouachita River, digging for diamonds, mining for quartz crystals, hiking the trails in the Ouachita National Forest, golfing, or fishing are on your Southwest Arkansas vacation "to do" list, please check us out. We are centrally located to all of these and many more great Arkansas adventures. Or maybe you would just like to rest and relax while surrounded by the beauty of God's creation. We are the perfect place for that! "The amenities are great and absolutely well maintained. The trip was short, but we enjoyed every moment. We plan to come back here again." "We really enjoyed our stay! How wonderful to have the beautiful creek right outside the front door. The cabin is beautiful and very well kept." "The pictures didn't do justice! PERFECT is the only word to describe the layout. We spent time in that cool, cool, refreshing water. Clear straight to the bottom! We believe God will send the weary and worn to this anointed "place" of His holy presence, to be supplied with the deepest needs of their souls." "During our family travels, which have taken us all over the world, we have always tried to find unique, special places instead of getting a hotel room. We were so happy we made the choice to stay at "Living Water"; as it is quiet, peaceful and truly relaxing! Our only mistake was not staying longer!" "Our second visit here has been just as beautiful and blessed as our first. Both times we've faced adversity, sought a safe haven, and have been given a wonderful peace. The sincerity of your walk with Christ fills this place with a serenity and beauty rivaled only by heaven." "Grab your coffee, sit on the porch, as I have done every morning, listen to the calmness of nature and the babbling creek in front of you. It will be at that time, you will hear that stillness of His spirit... just touch you! It is amazing!" "What a blessing! God knew right where we needed to be and it was right here. This has been, I believe, the best time I have ever had and I pray we will return again soon." "This place is the most remarkable place ever, and I do believe that God Himself has handcrafted this beautiful haven. Not only has the stay here been incredible, but the gang and I have made memories that I will cherish for a lifetime." "We really enjoyed our stay. The cabin is just wonderful and we are at awe with the creek and front porch. These cabins will truly bring a lot of joy to many families to come. We will recommend you over and over." "He that believes on me... out of his belly shall flow rivers of living water."